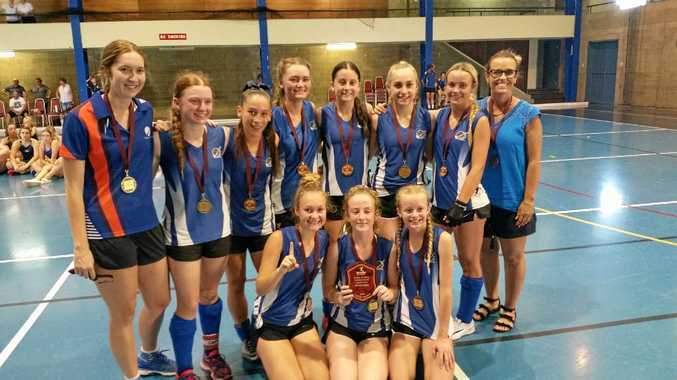 HOCKEY: Fraser Coast can claim to have the best under-15 female hockey players in the state after Maryborough's stunning success at the Hockey Queensland Indoor Challenge. Maryborough Blue claimed the Division 1 state title in dominant fashion. They didn't concede a goal as they romped to the title at the Maryborough Showgrounds tournament. Maryborough Orange was seventh in Division 2. The region's comes just months after the Fraser Coast claimed the under-15 field hockey state title at Hervey Bay. Maryborough Hockey's Shane Palmer said local players shone at the titles. "They're a talented group of girls and they've cleaned up both the field and indoor titles now. They're a very talented group of kids who want to push for the next level," he said. Seven players were picked for Queensland. Player of the Tournament Annelyse Tevant led local selections Hannah Cullum-Sanders, Andie Griffin, Maddy Kenny, Isabella McMahon, Phoebe Fraser and Andie Staples, while goalkeeper Lily Browning was named a shadow player.